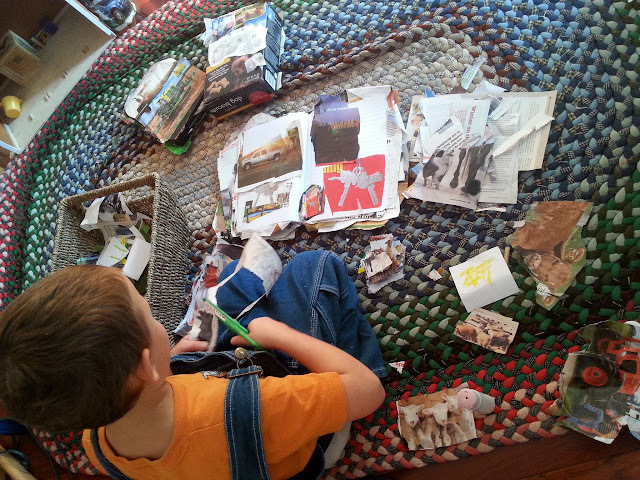 My hard to separate little boy has been SO successful at the homeschool co-op we attend. And my little girl does just fine too. It's been so amazing watching both of them bloom there. I get to see first hand, as I spend 1/3 of the time teaching his class and 2/3 of the time assisting/teaching hers. We're so fortunate to have this co-op. These moms are absolutely amazing. Today was different in that I spent the whole time in his class other than an hour. 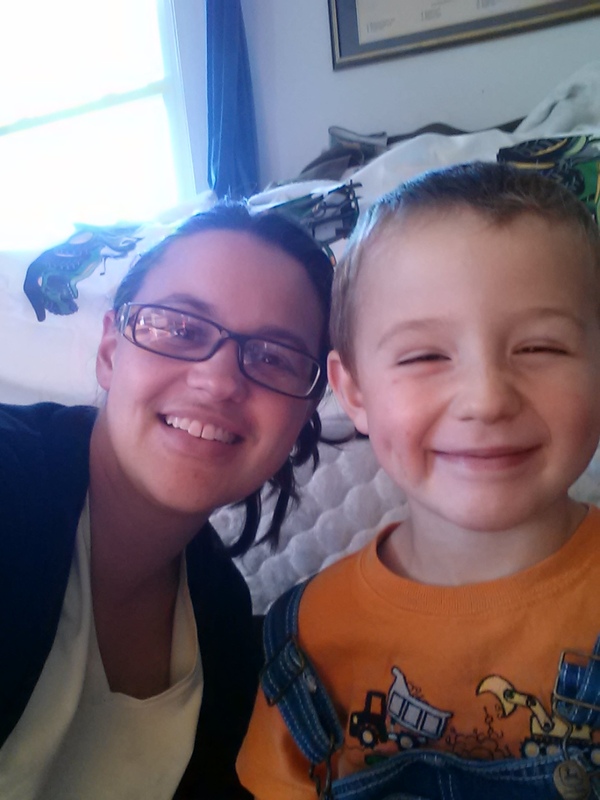 When we were leaving to go home, he said "Mama, that was fun, only I really miss you. I've been needing you and missing you." Dude...we were apart for an hour. But I know what he meant. He meant 1:1 time. When he gets home from these events sans mama, he needs time to do one of two things: Set up his play farm or do his farming art. Today was his farming art. Have I ever told you about his farming art? He saves everything. Everything. 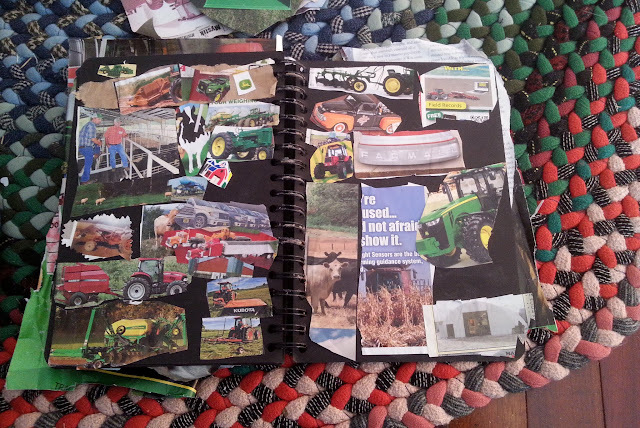 Well, everything that has a tractor, cow, barn, windmill, antique car, barbed wire, grain hoppers, etc. 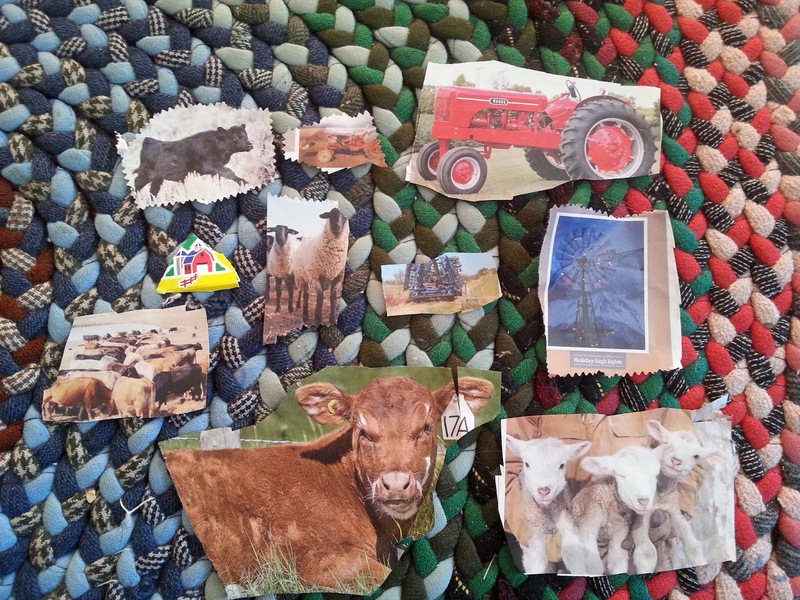 Clippings from butter containers. Tags from John Deere Clothes. Pieces off receipts. 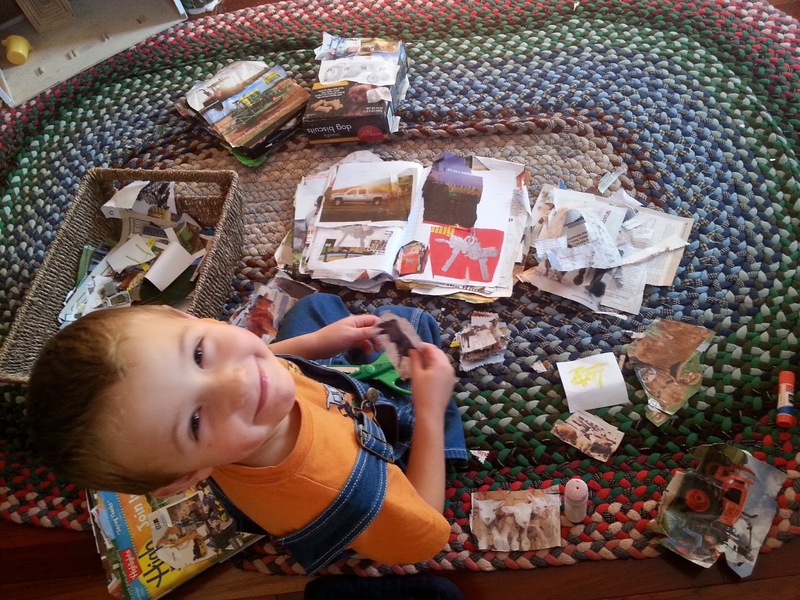 Clippings from the boxes of toys he's gotten as gifts. Clippings from magazines/calendars. I don't even know where he gets all the stuff he has. But he remembers. He'll say "Oh, Mary sent that to me in the mail." He has baskets full of clippings. He has volumes of notebooks filled. We buy so many gluesticks. It's his favorite art. He says these books are to go through when we want to feel happy because he gets happy looking at them. Today I left the kitchen a mess and made a little time to do his art with him. He gave me glue duty. He smiled the whole time I was helping. He said that doing farming art was his most favorite part of the day. You know, I think it was my favorite part too. Oh my gosh. That boy is just too adorable. Enjoy these days, girl. Love that you found a great co-op!